A recap of sorts and where everything stands now. Since the Military led coup to oust Prime minister Thaksin Shinawatra in late 2006 Thailand has been on edge politically and it’s now rapidly coming to a head. The military coup of 2006 supported by the king was peaceful and largely uneventful as the prime minister was out of the country when it was staged. The coup gave way to a ruling military junta that reigned over Thailand for a little over a year, bringing a new constitution to the people before promised general elections took place in December of 2007. 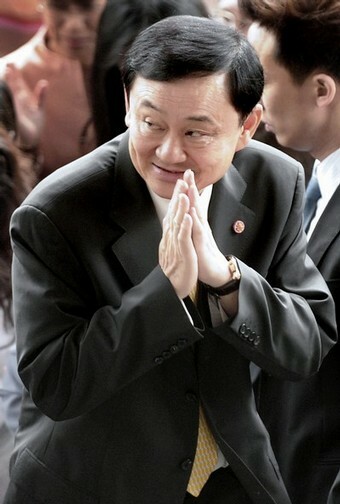 During their year of reign the military Junta had former prime minister Thaksin’s Thai Rak Thai Party dissolved by the courts. 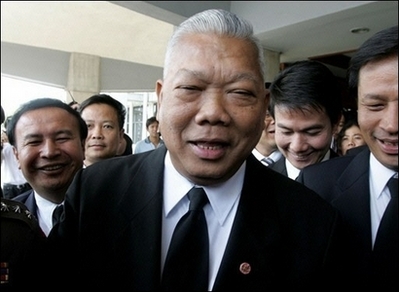 During the run up to elections a new political party emerged called the Peoples power party (PPP) which was the same old Thai Rak Thai party with a new name and although the military junta did what it could to suppress the new Peoples Power Party they still managed to win 226 out of the 400 parliament seats during the general election. This put the PPP in position to control the majority in the house of representatives and after much debate with the other parties winning seats in the house the PPP became part of a coalition that held majority and elected from it’s ranks Thailand’s new prime minister Samak Sundaravej. Samak Sundaravej spelled trouble from the start. He is not well liked due to his support of deadly force used on peaceful protests in the early 1970’s and again in the 1990’s. 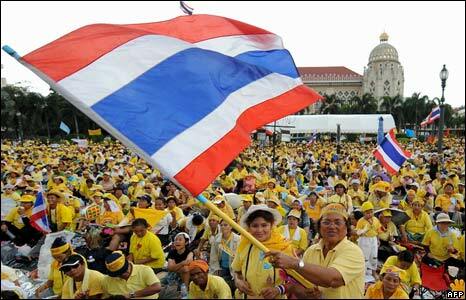 More recently he is resented as just being a proxy for ousted prime minister Thaksin. His coalition of parties led by the PPP are seen as anti military, anti-elite, and pro Thaksin in nature. The rise of the Thai Rak Thai Party and the subsequent PPP relied heavily on rural support with programs to help rural farmers and end poverty. The biggest problem for the PPP and it’s new prime minister is that they are seen as just an extension of former prime minister Thaksin’s corrupt administration. 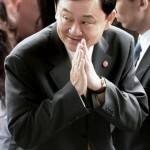 Thaksin and his family profited handsomely during his tenure as prime minister and by all accounts he and his family pocketed billions of baht from shady land dealings to selling off his family’s controlling share’s of Shin Corp telecom to Singapore’s Temasek Holdings which angered many as Thaksin was seen as using his political influence to build an empire. Many people believe the new government led by the PPP will write a new constitution and help Thaksin absolve himself of any wrong doing. Thaksin and his wife are now seeking asylum in England after fleeing Thailand before verdicts were handed down by the courts against his wife. This brings us to The People’s Alliance for Democracy (PAD), a coalition of conservative elite’s from Bangkok and the south with support from the military and Thailand’s labor unions, originally formed to protest and help oust former prime minister Thaksin. Once this was accomplished they dissolved but after the elections in late 2007 they reformed to protest what they saw as Samak’s puppet led government. In the past 2 months PAD has led many public protests against the government calling for Samak to step down and for the PPP led coalition to quit. In the past 2 weeks PAD along with thousands of Thai citizens have seized the state run television station and the Government House where they have barricaded themselves in since. There has been an uneasy truce between the police and the protesters with many citizens coming to PAD’s aid with food, water, and clothing. Prime minister Samak indignant in the face of these actions declared he would not quit which led to Airport labor unions joining the fray and shutting down several airports for a while. Now with heightened tension and more labor unions joining the ranks of PAD it looks like there will be a nationwide shut down of services. Yesterday pro government party The Democratic Alliance Against Dictatorship (DAAD) Clashed with PAD supporters in Sanam Luang. Thai fighting Thai as Police were helplessly outnumbered by both sides to be of any help. The protests that have been mostly peaceful with few altercations has now turned bloody and claimed it’s first victim, Narongchai Korbthaisong, a DAAD supporter who was beaten to death by PAD security officers. DAAD has now threatened to raid the Democrat Party’s head office in retaliation to PAD’s takeover of State run Television and the Government house. The clash yesterday prompted Prime Minister Samak Sundaravej to put in place an emergency decree to quiet the protests in Bangkok. Samak will order officials to investigate the violence but as with the handling of the protests to this point the governments investigation would be inept at best. Now everyone in the country is awaiting a radio and Television address by Prime minister Samak due to take place 7am Wednesday morning. It’s believed he will speak to the people about the recent turmoil in the country but some are speculating that he will Announce his resignation. Sound like a soap opera? Hopefully this address, which Samak will give shortly, will be his decision to step down but whether or not that will quell the violence between rival protesters remains to be seen. 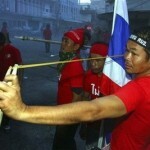 Thailand has a long hard road ahead of it, let’s just hope it’s not paved with the blood of it’s citizens. Samak addressed the nation this morning and declared he will not resign nor will he dissolve the House of Representatives. He went on to claim that PAD is like a cult and is disobeying the law and called for the 9 leaders of PAD to turn themselves in and defend their actions in court. 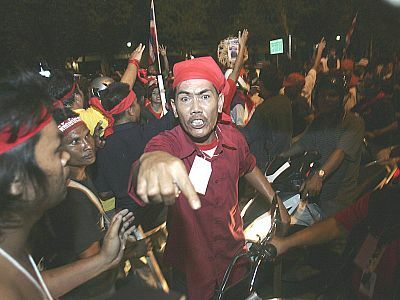 He is under the belief as well that the various labor unions will keep the country going without any more shut downs. Samak said the government would continue with it’s soft approach to the protests but he would have the Government house, which has been taken over by PAD, cleared by the military soon and without violence. 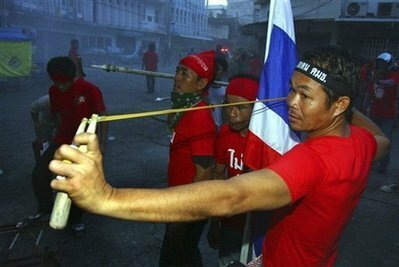 Like Thaksin, Samak will hold on as long as he can which will mean continued protests and I fear continued and escalating violence. Now would be a good time for the King to speak to the people as he is the only man in all of Thailand respected by all. I’m currently in Phuket. Yesterday I went looking for protesters. I went to the provencial HQ and only saw a few PAD sitting around. Other than that, I haven’t seen any evidence of protests down here (other than my flight from Penang being delayed for a day). You probably won’t see anything there. Center stage is Bangkok and that’s where all the action will be. If you’re heading to Bangkok I would steer clear of the protest areas…this isn’t going to blow over anytime soon and the protesters are armed. This is so interesting. What did Thaksin’s wife do that she was in trouble for? Was she pocketing money also? Thaksin’s wife Ms. Pojaman was convicted, with her brother and her secretary, of colluding to evade millions of dollars in taxes in 1997 by transferring shares in the family business to one of the family’s maids. She received 3 years jail time but bail and for some reason they were allowed to leave the country to attend the Olympics starting ceremonies but instead of coming back the day after they flew to England.